The term “virgin” is applied to virgin olive oil since The International Olive Oil Council clearly defined what a virgin olive oil is and in what manner it may be produced. Virgin coconut oil is a newly created standard and is only recognized at regional level. It is yet to be accepted by the international community, although there are generally understood principles laid down in the body of literature and research surrounding virgin oil production. It is generally accepted that the processing of virgin oils should undergo no thermal or chemical treatment during any stage of oil production. With olive oil there is one generally accepted method to produce virgin olive oil although centrifuge extraction is now providing an alternative means. With coconut oil standard industrial grades, natural village pressed and virgin coconut oil are derived through completely different technologies. Within the area of virgin oil asll there are different technologies and methods. This leads to wide variations in quality of final product. 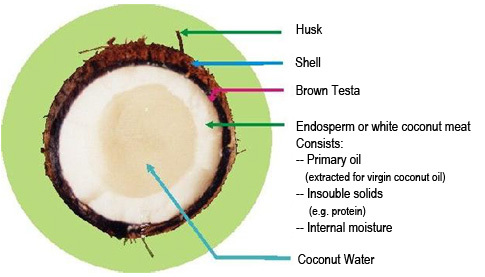 (See Table 1 and non-copra processing of coconut oil). What Does “Cold Pressed” Really Mean? If oil is marketed as cold-pressed the implied message is that the product is only lightly processed and has not undergone refining. This may or may not be the case. “Cold pressing’ literally refers to the pressing procedure and indicates that no heat is applied during pressing. It makes no reference to raw material preparation before pressing or to purification processes performed after pressing. “Cold pressed” is a technical term with very specific meaning. It is sometimes used to advantage in marketing products with an eye to suggesting a higher degree of naturalness. With olive oil, the procedures for material preparation and purification after pressing are specifically defined. Because there are many different ways to process coconut oil, this type of guideline has been left open to interpretation. Is Virgin coconut Oil Cold Pressed? All virgin coconut oils are cold pressed. This includes even the village methods where oil is boiled after pressing. Why is processing so different for coconut oil compared to olive oil? The milk / oil emulsion obtained from pressing fresh coconuts is 50% moisture. One of the major challenges in coconut oil production is to reduce the moisture content of freshly pressed coconut milk / oil emulsion to a level considered safe: 1%. An oil, protein and water emulsion will not separate on its own – marketers claims to the contrary notwithstanding. This is something that anyone with commonly available kitchen tools and some time can verify on their own. Time, moisture, and temperature are inter-related. mechanical means such as centrifuge technology. You need to stop fermentation at some point typically either by heating, by acidic treatment and similar procedures. This is needed otherwise, the oil will not be collected as it will turn out to be a fatty acid derivative. If you have a centrifuge technology (and know how to set it up properly) you can break the chemical bonds within the emulsion without using heat or chemicals. If you don’t know how to set up a centrifuge system properly you can use fermentation to aid the process although the result will still have the telltale taste of fermentation process. Basically, coconut oil has lauric acid around 42-50% plus and minus one %. Some producers in the Philippines have made a claim to have high lauric content although to date there is no published verification for this. Was this (difference) achieved as a natural process? Is the result consistent over time? Is the result consistent between testing methods and / or labs? What is the effect on the remainder of the medium chain fatty acids? Quality First International is dedicated to educating people to understand how coconut oil is made and to provide some tools that will aid in one’s own evaluations using science, research and intuition. While we believe the highest grade coconut oil conveys a higher benefit, we also believe that all coconut oils in whole form (whether refined or virgin) are sources of beneficial medium chain fatty acids.